Marc Werner, MD of Stahl Eyecare is offering the Vision For Our Heroes program to provide 30% off Lasik for New York City area fire fighters, law enforcement, teachers, and military personnel. Even immediate family members (spouse, children) can get the discount! Stahl Eyecare surgeons are Harvard, Yale and John Hopkins trained and have performed over 40,000 Lasik procedures. Lasik has been proven so safe and effective that it has been approved by NASA for use on US astronauts, pilots, and mission payload specialists who face extreme, physically demanding conditions. One floody jeepney ride, one passenger caught my attention. He was a student and was barefooted. He was holding his shoes in his hands amid the cold weather, the flood and the jam packed passengers inside the jeepney. How precious those shoes must have been for him to prefer to be barefooted than to soak those shoes on the flood? The shoes that must protect his feet had not serve its purpose but its the other way around. It might be his only shoes that it must not get wet in order for him to be able to use it on the following day. It is a common scenario in an impoverished nation. Some students experience this and endure this just to finish their studies. Luckily, when I was a student there was no flood in my province or in the place where I stay here in the city. I was not able to experience this one but I take good care of my shoes because my mother could not readily provide me new shoes in case it would be ruined. The prices of shoes is too expensive for us. The student who was holding his shoes reminds me of my years as a student. 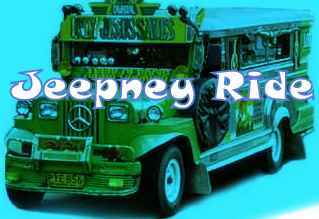 It has been a jeepney ride in the memory lane. Till the next ride guys. Bye for now. Now that I am staying away from my workplace, I am always chasing time not to be late from work. In going to work my transportation entails two motorcycle rides and two jeepney rides. If I would not be late, I could let go of one motorcycle ride and just walk that short distance from the jeepney stopover towards our office. Luckily, I was not late since the time I transferred to my mother's house. Well, thanks to my husband who always drives for me in going to the office whenever he is in the city. When he is not around, I must wake up early in order not to be stranded in the traffic or wait for a couple of minutes for a jeepney ride. I must not be late or else there would be a deduction in my payroll. I hope my everyday jeepney ride would go smoothly away from traffic and most importantly away from accidents. I promised my husband not to complain about it because what I am experiencing is a small sacrifice compared to others. Goodluck to my everyday jeepney ride and hope chasing time would be minimized.